Advanced Liquid Packaging brings you tablet or capsule counters which are extremely important for productions in the pharmaceutical and nutraceutical industries. Featuring speeds up to 80bpm, we offer you our 16 track tablet counter. Representing the high speed tablet counter, we have the 24 track tablet counter that fills a number of 100 count bottles at a speed of 110bpm. The VC-12 sets a new standard for the Industry. With its heavy duty construction and tooless teardown, the Value Count will give you outstanding production. With a PLC controller and a color touchscreen with a 100 recipe storage, the VC-12 has all the top features. Using laser scanners and PLC logic gives extreme count accuracy. Model ALP-16 is a 16 Channel Tablet counter which is great for counting pharmaceutical products such as capsules, tablets, pills and such materials. The counter is available in both 16 & 24 channel options and each machine has 2 nozzles designed for successful operation in coordination with any application. Model ALP-24 is a 24 Channel Tablet counter which is great for counting pharmaceutical products such as capsules, tablets, pills and such materials. The counter is available in both 16 & 24 channel options and each machine has 2 nozzles designed for successful operation in coordination with any application. The Model SC-301 is a Semi Automatic Tablet Counter very much suitable for running small businesses or for small scale use in laboratories. Product flows in bulk through troughs spilling over a waterfall drop. High-speed, high-res camera combined with high-powered CPU counts product with 100% accuracy and double the output of a comparable 12 track counter. 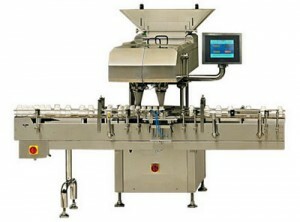 Gummies flow forward in bulk through six vibrating troughs until spilling over a waterfall drop. High-speed, high-resolution camera combined with a high-powered CPU counts gummies with 100% accuracy.